ARLINGTON, Texas (AP) Joey Gallo wore a big grin as he rounded the bases during his 40th home run of the season. Normally stoic after his homers, Gallo couldn’t help himself. Gallo had a two-run homer in the second inning and a solo shot in the third, becoming the sixth Ranger to hit 40 homers in a season and the first since Josh Hamilton had 43 in 2010. Gallo ranks fifth in the majors in home runs. He also walked twice and scored on a single by Rougned Odor in the seventh. Andrew Cashner (11-11) limited Oakland to five hits and two runs in six innings. He finished his season with a 3.40 ERA, good for ninth in the AL. A soon-to-be free agent, it could have been the native Texan’s final game with the Rangers. ”It felt great, it was kind of one of those moments where you soak it in and try and go out there and do the best you can,” he said. Gallo gave Cashner an early lead when he homered on a 1-1 pitch from Daniel Gossett (4-11) that hit the batter’s eye in straightaway center. Texas tacked on two more runs in the second when Odor and Jared Hoying had back-to-back doubles and Delino DeShields singled, knocking out Gossett after 1 2/3 innings. ”I wasn’t able to slow the game down and make my pitches. It sped up on me, I lost track of the plan,” Gossett said. Oakland cut the lead to 5-2 in the sixth on a double by Khris Davis and an RBI groundout from Matt Chapman. Texas added two more runs in the sixth when Willie Calhoun had an RBI single and then scored on a double from Elvis Andrus. 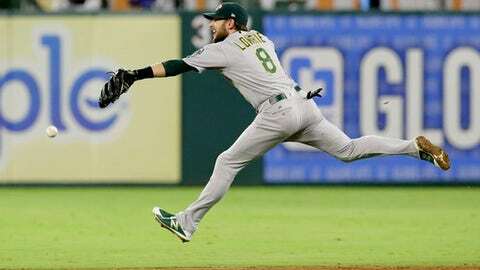 Matt Joyce hit a solo homer for Oakland in the eighth and Marcus Semein homered in the ninth. Oakland RHP Kendall Graveman made his final start on Sept. 27 against Seattle, but he’s still helping out his teammates during the series against Texas and has been volunteering his time as a clubhouse assistant. Bruce Maxwell took to a knee in the Oakland bullpen during the national anthem. The catcher was warming up Gossett and out of view from many fans, but was still booed by a handful of attendees. Maxwell has been the only major league baseball player to kneel for the anthem, a movement started by former San Francisco 49ers quarterback Colin Kaepernick to protest police treatment of blacks. Mawell was booed before each plate appearance Saturday. Rangers: Rangers manager Jeff Banister said 3B Adrian Beltre (strained hamstring) could make an appearance Sunday – possibly as a pinch hitter – so fans could see and honor the player to close out the season. Athletics: RHP Daniel Mengden (2-2) will make his fourth start since getting recalled from Triple-A Nashville on Sept. 5. Rangers: LHP Cole Hamels (12-5) will close out the season for Texas and looking to rebound from a loss against the Houston Astros on Sept. 26.